Members of the Carpet Museum Trust visit the Stour Vale Mill on the occasion of their 30th anniversary. 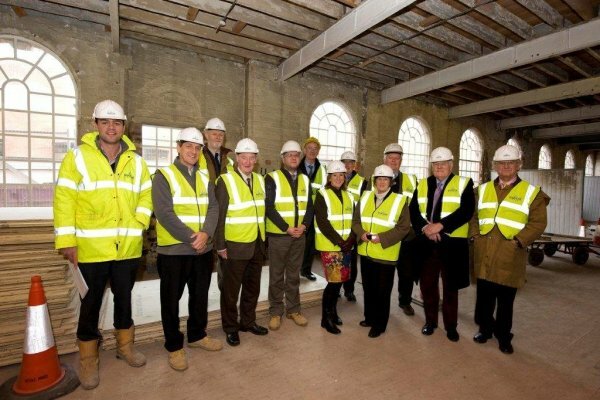 The Carpet Museum Trust marked its 30th Anniversary on 3rd December 2011 with a site visit to Stour Vale Mill to see how Shaylor’s, the project team, were progressing on converting the old building into the new Museum of Carpet. In the photograph are Viscount Cobham, Patron of the Trust, accompanied by the trustees, Richard Pugh-Cook (Chairman), Charles Talbot (Secretary), Robin Hill, Linda Collis (representing Wyre Forest District Council) and Peter Reed the Project Manager. Also present were Shaylors project team and volunteers, Melvyn Thompson, Jean Talbot and Christopher Dale.